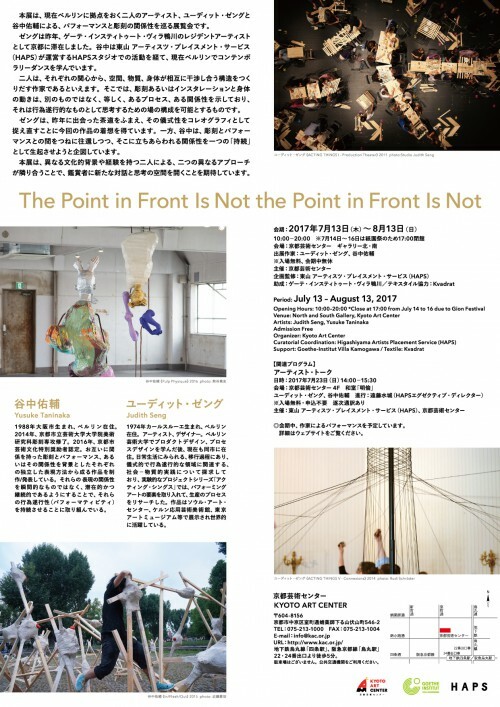 Kyoto Art Center presents the exhibition, “The Point in Front Is Not the Point in Front Is Not”, to which Higashiyama Artists Placement Service (HAPS) has provided curatorial coordination, from July 13 until August 13, 2017. 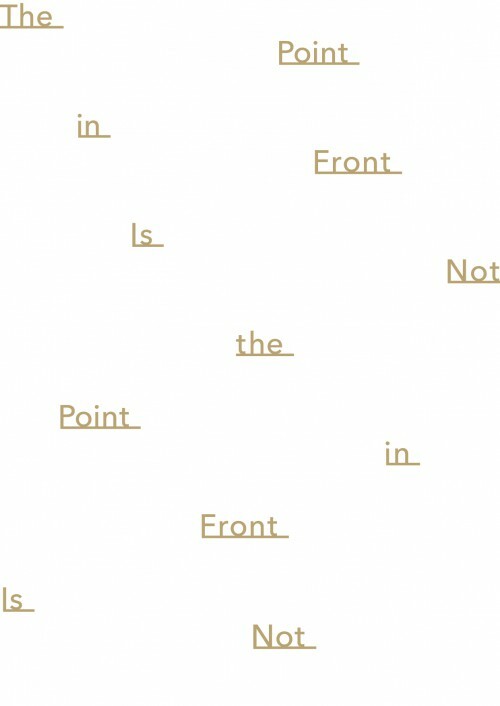 This exhibition features the artists Judith Seng and Yusuke Taninaka, both currently based in Berlin, and reflects on the relationship between performance and sculpture. Seng stayed in Kyoto for three months last year as a resident artist at the Goethe Institut Villa Kamogawa. Taninaka has worked at HAPS Studio, run by Higashiyama Artists Placement Service (HAPS), and is now studying contemporary dance in Berlin. Both Seng and Taninaka create structures in which space, material, and the body interact. Sculpture, installations, and movements of the body are not separate, but, as a whole, indicate a process or a relationship, which makes possible compositions in which they can be seen as performative. Seng is inspired by the Japanese tea ceremony she experienced in Kyoto, seeing its ceremonial nature as choreography, while Taninaka, always moving between the domains of sculpture and performance, intends to make relationships occur as “duration.” This exhibition shows two approaches by two artists with different cultural backgrounds and experiences, aiming to open a space of dialogue and reflection. *10:00 – 17:00 on the 14th, 15th, and 16th of July. Judith Seng is an artist and designer based in Berlin, Germany. Her work investigates socio-material practices found in daily life in transition and relation to the ceremonial and performative realm. Her work is presented in contexts spanning exhibitions and performances applying to daily life, as well as academic contexts. Her projects have been exhibited at institutions throughout the world, including Art Centre Seoul, Carousel du Louvre Paris, Museum für Angewandte Kunst Köln, Kunstgewerbemuseum Berlin, Gesellschaft für Kunst und Gestaltung Bonn, Museum der Dinge Berlin, MARTa Herford, Appel Design Gallery Berlin, Post Design Gallery Milan, Neumeister in Munich, and Helmrinderknecht Berlin. Her work can be found in the collections of the Fonds National d`Art Contemporain (FNAC) (2002/2010) and Centre National des Arts Plastique (CNAP) in France (2012), and Kunstgewerbemuseum Dresden in Germany (2014). As Fellow of the Graduate School of Arts and Science at University of the Arts Berlin (2010-2012), she initiated the ongoing performative installation series ACTING THINGS that was staged, among others, at Hebbel Theater (HAU) in Berlin, Germany (2011), Depot Basel in Switzerland (2012), and commissioned by Design Miami/ Basel in Switzerland (2013) as well as Kunstgewerbemuseum Dresden (2014). In 2016, she was artist in residence at Villa Kamogawa in Kyoto, Japan. Currently, she is guest professor in design at HDK – Academy of Design and Craft in Gothenborg, Sweden. Taninaka (b.1988, Osaka) lives and works in Berlin. His sculpture and performance are interrelated, and each independent work is based on these relationships. His interest is in that these relationships maintain not instantaneously but potentially and continuously their own performativity. He completed his B.F.A. in sculpture at Kyoto City University of Arts, Japan in 2012 and earned Kyoto City Special Bounty for Arts and Culture in 2016. He has also been awarded with Grand Prize of Art Award Tokyo Marunouchi (2014), Sadame Kato scholarship (2013) and other prizes. His solo exhibitions include Galatea (Kyoto City University of Arts Art Gallery @KCUA, Kyoto, 2014), In/Flesh/Out (Kunstraum Kreuzberg/Bethanien, Mariannenplatz, TWS resident room, Berlin, 2015). He has also been in numerous group exhibitions including transmit program “still moving” PARASOPHIA (Kyoto, 2015), RETURN TO (Tokyo Wonder Site Hongo, Tokyo) Joan Jonas Workshop Exhibition (Villa Iris of The Botin Foundation, Santander, 2016), Chronicle, Chronicle! (Creative Center Osaka, Osaka, 2017).